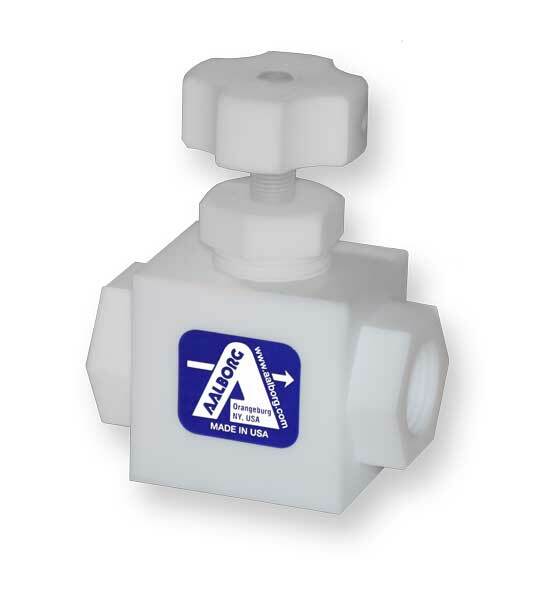 PTFE needle valves are designed for laboratory and industrial applications for regulating corrosive gases and liquids or for high purity service. They may also be used as shut off valves. Fluids contact only PTFE and PCTFE materials. Bushings are made of 316 stainless steel. Valve spindles are made of rigid PCTFE to minimize the undesirable material “creeping” normally associated with PTFE. PTFE valves are designed for relatively high flow ranges while still performing well in low flow rates. Valves may be used in pressure or non-critical vacuum service. The simplicity of design - there are only six components (including a single PTFE o-ring) - assures reliability and minimizes sources of leakage. It takes seconds to disassemble the valve for cleaning and maintenance. The PTFE o-ring is radially compressed and due to this unique design feature the degree of compression may be adjusted without disassembly by tightening the bushing. NON-FLUID CONTACTING MATERIALS Bushings 316 stainless steel.Mounting Nut and Adjusting Knob Delrin.